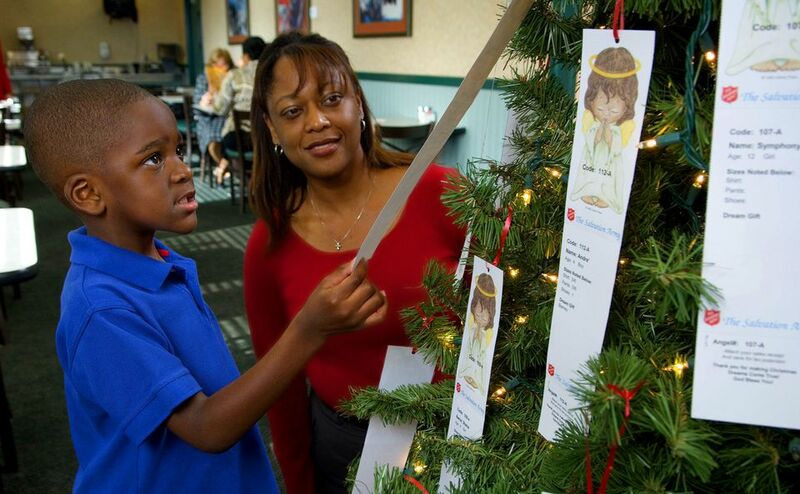 The Salvation Army's Christmas Angel program is a tradition in Arizona that began in 1986. This is a very personal way in which you can brighten the holidays for a needy child by purchasing new clothes or a toy for that specific child. In a recent year the program distributed toys to more than 50,000 children in Arizona. Christmas Angel trees can be found in various Phoenix area shopping malls. Each of the trees is decorated with Christmas Angel tags that represent a boy or girl 16 years of age or younger. These are children whose families have qualified for holiday assistance through the Salvation Army and have met the criteria established by the organization. To buy a gift for a Christmas Angel, simply remove the tag from the tree, register the angel with a volunteer, and then shop for your angel. Return your gifts by the deadline to the volunteers at that same location, unwrapped, and the Salvation Army will take care of the rest. Any gift you give is appreciated, and 100 percent of your donation will go to a child in need and brighten his or her Christmas. Some children ask for costly gifts, but some do not, or some are very young and just need basics. You can buy the gifts wherever you like; you don't have to buy them at the mall, but they must be new items. The greatest need is for teenage boys. Basketballs, footballs, and the like are good and reasonably priced options. The Salvation Army recommends spending about $25 to $30 per child, although a more modest donation is always welcome. The organization supplements with additional gifts from cash donations. If you want to spend more than $40 per child, the Salvation Army suggests that you choose two angels. It seems easiest to buy gifts for younger children, but every year a large number of children in the 8- to 16-year-old range are left out because no one selects them. If you choose a tag, buy a gift and return it to the mall volunteers. Do not select a tag and then not follow through. Dates for 2018 are November 16 through December 20. Stop by early for the largest selection.